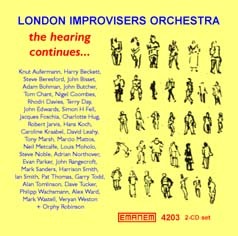 More than thirty of the finest musicians on the London scene, directed by STEVE BERESFORD (featuring Alan Tomlinson), ADAM BOHMAN, CHRIS BURN, RHODRI DAVIES (featuring Chris Burn & Matt Davis), SIMON H FELL (featuring Lol Coxhill, Rhodri Davies, John Edwards & Steve Noble), CAROLINE KRAABEL (featuring Terry Day), EVAN PARKER (featuring Kaffe Matthews), DAVE TUCKER, and PHILIPP WACHSMANN. 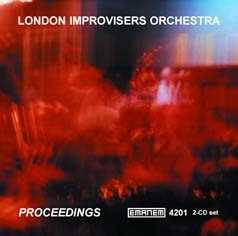 Also two improvisations by the full orchestra. 131 minutes. 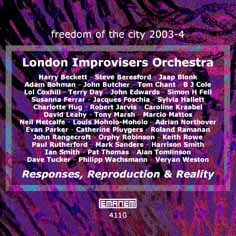 More than thirty of the finest musicians on the London scene, directed by KNUT AUFERMANN, STEVE BERESFORD (featuring Veryan Weston), SIMON H FELL, CAROLINE KRAABEL, DAVID LEAHY, EVAN PARKER (featuring Orphy Robinson), PAT THOMAS, DAVE TUCKER, PHILIPP WACHSMANN and ALEX WARD. Also two improvisations by the full orchestra, and two by sub-groups: (a) a saxophone sextet, and (b) three pianos, harp & four percussion. 147 minutes. 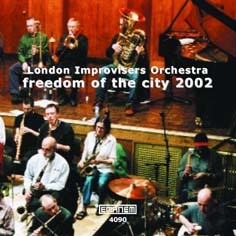 4206 freedom of the city 2001 "large groups"
A tribute to John Stevens by SIMON H FELL for orchestra & pre-recorded sounds. A poem & conduction by TERRY DAY for voice & orchestra. A concerto conduction by STEVE BERESFORD for PAUL RUTHERFORD & orchestra. A percussion trio improvisation by TONY MARSH, LOUIS MOHOLO & MARK SANDERS. A conduction by PAUL RUTHERFORD for orchestra & mobile phones. A conduction by DAVE TUCKER for orchestra. A conduction by PHILIPP WACHSMANN for orchestra & audience. - and a free improvisation. 66 minutes. 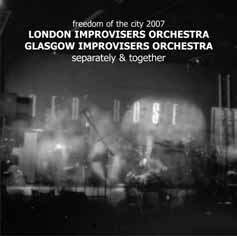 The whole of a 2007 Freedom of the City festival concert which was the first meeting of these two orchestras. The 27-strong LIO started the proceedings with conductions by Philipp Wachsmann, Ashley Wales, Alison Blunt and Terry Day interspersed with free improvisations. The 17-strong GIO then performed pieces devised by George Burt and Emma Roach and a free improvisation. Finally the two orchestras combined to be conducted by David Leahy, Una MacGlone & Raymond MacDonald, and Dave Tucker. 126 minutes.